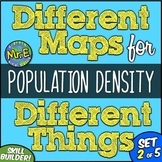 Different Maps for Different Things: A Population Density Mini-Unit! Engaging! 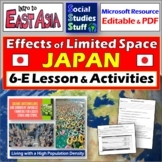 This lesson is designed to last for an hour of class time or longer. 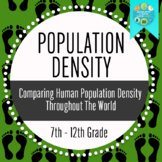 Students will be provided with background information about population density. They will show what they know by completing engaging classroom activities and answering various depths of knowledge of questions related to the lesson. 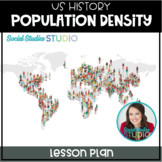 This worksheet was made to go along with the Population Density chart that comes with the Social Studies Alive! Grade 4 chapter 5 workbook. 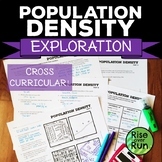 Ecology notes on population density and distributions within an ecosystem. 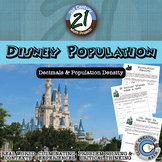 Both Student and teacher copies. Cut out poster board of different sizes as countries. 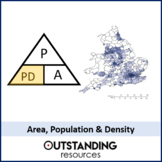 Have the students use the worksheet to calculate the population density of the countries. 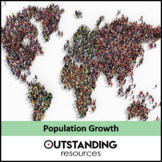 Two ten-minute social studies activities about using a world map: "People in the World" (students move and sit at desks to show population v. land mass) and "Continent Spotlight" (students guess continents from clues).